More of the Barack Hussein hangover! Hussein gave many illegal immigrants legal status (DACA), violating the Constitution in the process and taking a big dump on those entering America legally. It has only led to a mass attitude of entitlement by illegal immigrants. Dreamers (DACA recipients), who are actually illegal immigrants, thanks to their parents in most cases, are making demands, and they are doing it publicly. The latest target of the Dreamers’ ire is Nancy Pelosi, who has been chummy with President Trump lately in an attempt to convince the administration to leave DACA alone. Somehow, that isn’t enough for the Dreamers. They HATE President Trump for his adherence to US law and standing up for America and will not stand for their Congresswoman being cordial with him. The Dreamers chanted “You are a liar” to Pelosi. Duh! 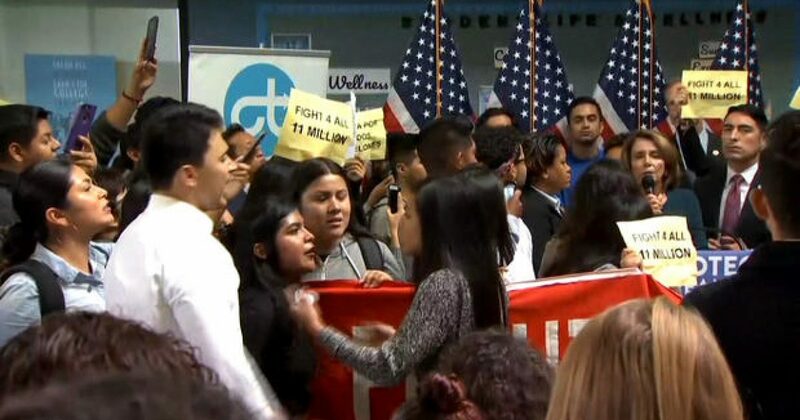 SAN FRANCISCO (CBS SF) — A vocal group of undocumented youths and their supporters drowned out House Minority Nancy Pelosi Monday at a news conference where she was calling on the Trump administration to immediately pass the DREAM Act. She had began her speech, calling dreamers courageous.